The auto industry has spent 5.8 billion euros on autonomous driving solutions in the last 2 years and will spend up to 27 billion euros more on the technology over the next 5 years, according to estimates. Fear of disruption from companies such as Google and Uber has prompted automakers to pour billions into developing self-driving cars. Now they are realizing that achieving the dream of fully autonomous driving will take much longer than their initial promises. "Some automakers have claimed they are farther down the road than they actually are. Many have started to realize this will take more time," Ian Robertson, BMW brand's global sales boss, told UK journalists in March. He said BMW had known this "from day one." The advances in technology, the proliferation of test cars, the increase in investment and the eager cooperation of legislators are still overshadowed by the enormity of entrusting lives to a computer on a scale never seen before. "Historically, humans have shown nearly zero tolerance for injury or death caused by flaws in a machine," Gill Pratt, CEO of Toyota's mobility-focused Research Institute, told an audience at the Consumer Electronics Show (CES) in Las Vegas this year. The penalty for getting it wrong is so severe that manufacturers such as Toyota, Ford and Volvo are saying they will skip the next major stage of driving automation, Level 3, which allows hands-off capability but requires the driver to take back control at any time. Instead they are concentrating on reaching the most automated stages, Levels 4 and 5. Despite the reality check, the consensus is that autonomous vehicles will arrive and will pay off handsomely for companies that manage to deliver. Max Warburton, an analyst at investment research firm Bernstein, is skeptical about many elements of the promised mobility revolution. In May, Warburton warned in a note to investors that autonomous cars are "almost certainly far further away than some of the hyped headlines you may have seen." But he also said that they have the potential to upend the industry structure and the economics of car ownership "in a far more dramatic way than electric vehicles." Ford believes new mobility services, including autonomous driving, could bring the company profit margins of 20 percent. Analyst firm IHS Markit maintains its year-old prediction that autonomous cars will reach global sales of 600,000 by 2025 and 21 million by 2035, led by the U.S and "major markets" in Europe. The automotive industry globally has spent $6.5 billion (5.8 billion euros) in the last two years on autonomous driving technology, with another $20 billion to $30 billion (18 billion to 27 billion euros) expected over the next five years, IHS estimates. "It's a major investment when you look at the compressed time frame," said Egil Juliussen, IHS director of research in automotive technology. Daimler, judged by Bernstein's Warburton to be one of the leading automakers in the self-driving tech race, plans to spend 8.1 billion euros on r&d both this year and next year, up from 7.6 billion euros in 2016. A key reason for the increase is to pay for "the development of future mobility," the automaker said in its first quarter financial report. Along with electric vehicles, automakers' investment in autonomous cars is changing their business model to outsource more parts traditionally made in-house to free up cash, said Francisco Riberas, CEO of metal parts maker Gestamp. "It's a huge amount of money they need [for new technologies]. I think that is why outsourcing is now accelerating,” he told Automotive News Europe. Some of those big investments that Riberas eluded to are well known. General Motors spent $1 billion to buy Cruise Automation last year. This year GM announced it would add 1,100 jobs at the California-based autonomous specialists over the next five years. Ford announced in February it would invest $1 billion in artificial intelligence startup Argo AI over the next five years, making it a major investor. U.S. Chipmaker Intel spent $15.3 billion on Israeli camera sensor maker Mobileye in March. The move will help Intel in its battle with rival chipmaker Nvidia. Intel this year also bought a 15 percent stake in the 3-D mapping firm HERE, which was jointly purchased in 2015 for $3.1 billion by Daimler, Audi and BMW from Nokia. When they are not purchasing or investing in tech firms, automakers and suppliers are joining forces to assuage the feeling of "uncertainty" that they might be lagging, IHS's Juliussen said. The latest announcement came from Delphi, which in May said it would join the BMW/Intel partnership to help the German automaker debut its first fully autonomous car in 2021. To reach that target BMW knows it will need some help. "We are not the best in making radars and vision controls, so we work with Mobileye," BMW Group CEO Harald Krueger told journalists during a roundtable discussion in Munich last month. "We do not make chips, so we cooperate with Intel." Automakers and tech firms have been helped in their efforts to launch self-driving cars by the surprising willingness of legislators in Europe and elsewhere to let them test autonomous cars on public roads. The greater freedom will help increase the global test fleet for autonomous cars from about 200 to 250 now to 2,000 to 3,000 by the end of 2018, IHS believes. In Europe this year, BMW will launch 40 self-driving 7-series sedans and Volvo will test autonomous XC90 SUVs with 100 families in Gothenburg, Sweden. Governments are keen to promote testing of autonomous driving both to attract investment and to help reduce accidents. "Most of the advances are positively contributing to safety, so an excessively cautious approach could stifle this advancement and actually cost lives," UK Business Secretary Greg Clark said at an industry conference in London this year. Germany has gone even further. It is poised to enact a new law that will essentially allow Level 3 and Level 4 automated driving for any car as long as a licensed driver remains at the wheel to take over when necessary. "This will make Germany a pioneer for automated driving," Audi CEO Rupert Stadler said at the firm's financial results press conference in March. Audi will launch what amounts to Level 3 automation in its new A8 flagship sedan later this year "as soon as legislation has passed," Stadler said. Drivers will be able to take their hands off the wheel and read a newspaper, send emails or whatever they like in highway traffic jams at speeds up to 60 kph (37mph) as long as they're ready to take over when asked. This puts Audi into Tesla territory for pushing the boundaries of autonomous technology. Daimler, despite its apparent lead in the sector, has said it won't have a Level 3-capable Mercedes on the market until the end of the decade while BMW’s Level 4 car, the iNext electric crossover, will launch in 2021. Some believe Audi already has Level 3 technology on the Q7 SUV. "Audi doesn't call it that. But when I look at its capabilities I know they can do it," said Mike Tzamaloukas, vice president of navigation technologies for supplier Harman, which helps automakers interpret data from autonomous cars. Tzamaloukas expects this subtle rollout of ever-smarter automated driving technologies to continue. "In two to three years, we will see more and more cars coming out that are Level 3," he said. Whether they are certified as Level 3 is another matter entirely. "That could take another decade," Tzamaloukas said. The updated Mercedes S class that arrives later this year is heading in that direction by reading its own maps and slowing down for tight bends. The forthcoming Volkswagen Arteon, which succeeds the Passat CC, will know if the driver is incapacitated and automatically steers itself to safety before stopping. To certify cars as Level 3 requires showing authorities test data that proves the likelihood of technology failure killing anyone is one in a million, the so-called ASIL-B (Automotive Safety Integrity Level B) part of the ISO 26262 road safety standard. No one can be that confident, Harman's Tzamaloukas said. "Right now, everyone in some ways can see the light at the end of the tunnel for 80 percent or even 90 percent of cases. But it's very difficult to see how your safety objectives will satisfy ASIL standards," he said. "Depending on who you ask and how conservative they are about the brand name, it may take a decade to get to a level of reassurance that their car is not killing anybody." The problem is so tough that some automakers have said they will bypass Level 3 and go straight to Level 4 or Level 5, both of which give the car full autonomy, with Level 4 restricted to certain zones. "It is possible that Level 3 may be as difficult to accomplish as Level 4," Toyota's Gill said. The CEO of Google's Waymo autonomous driving division, John Krafcik, has called Level 3 "a myth." The issue is the handover. If the driver is absorbed in a conversation, can the person react quick enough to take over in an emergency? "Considerable research shows that the longer a driver is disengaged from the task of driving, the longer it takes to re-orient," Gill said. Volvo CEO Hakan Samuelsson agrees. "Volvo considers the Level 3 driving mode unsafe and will thus skip this level of autonomous driving," he told a conference in Brussels this year. 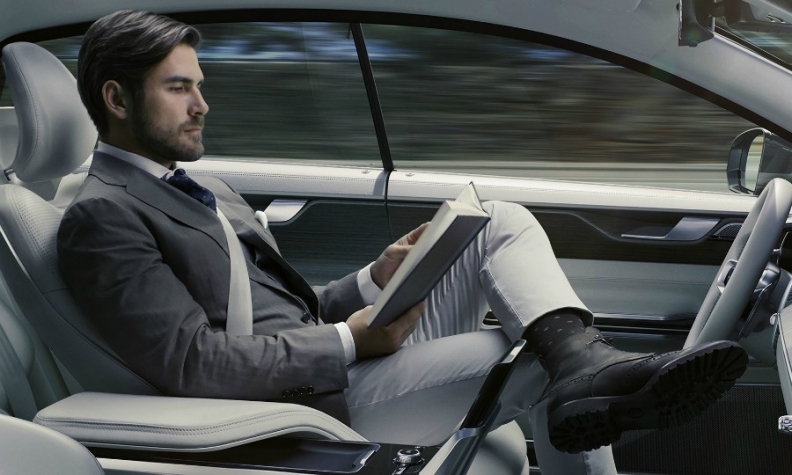 Volvo's first autonomous car will be Level 4 when it arrives in 2021. Ford will also skip Level 3 to offer a Level 4 car, also in 2021. In Europe, the problem is compounded by potential rule changes at country borders. Level 4 by 2021 is a popular target for automakers. "Many of our customers are predicting Level 4 by 2021," said Harman’s Tzamaloukas. 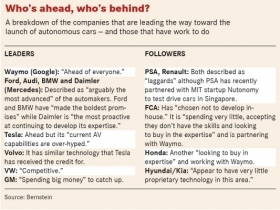 But don't expect vast fleets of self-driving cars, warns Bernstein's Warburton. "Talk of companies such as BMW and Ford putting AVs [autonomous vehicles] on the road by 2021 needs to be taken with a pinch of salt -- these are very low-volume, high-cost products that will operate in limited geographic areas and not be available for general purchase," he wrote in a report. A host of issues remain. Will authorities ever allow Level 5 cars to drive around on their own when there's a possibility they could be loaded with explosives? Will countries tolerate the loss of jobs that will surely accompany a move to fully autonomous vehicles without at least a compensatory tax? How will companies differentiate brands when they're essentially selling a self-driving waiting room? What about the issue of increased traffic from so-called "zombie cars," driving around without a passenger and looking for parking after having dropped off someone? The U.S. state of Massachusetts recently proposed a tax on any future zombie cars in attempt to eliminate that scenario. But it's also clear that autonomous cars will also bring huge benefits. Manufacturers argue that rather than cause traffic jams, autonomous cars will alleviate them by getting rid of the ripple-effect delays caused by sharp braking or sudden lane changes. Ponz Pandikuthira, Nissan's European product head, gives the example of the Brussels police, which lead groups of cars out of the city at the start of the summer holidays to prevent gridlock. "That's what autonomous driving will get rid of. By steadying the flow, you get a dramatic reduction in congestion," Pandikuthira told journalists at this year's Geneva auto show. He said Nissan will start selling a Level 3 automated car in 2020. Traffic jams can be eased when just 5 percent of vehicles are automated, a study carried out by the University of Illinois discovered earlier this year. Autonomous cars are expected to make driving safer. "Human error is by far the leading cause of fatal accidents. We have the possibility to eliminate human error," Doug Davis, senior vice president of Intel told a UK conference earlier this year. An investigation by the U.S. National Highway Traffic Safety Administration into the fatal accident last year in which a Tesla drive was killed after the autopilot function failed to spot a truck across the highway not only exonerated Tesla, but noted that based on airbag deployment figures, Teslas programmed with Autosteer lane-keeping software suffered almost 40 percent fewer accidents than those without it. Intel's Davis quoted Morgan Stanley figures predicting global savings of $5.6 trillion from a wholesale switch to autonomous cars, of which $500 billion came from productivity gains from returning those working hours lost in the commute. Whether the promised productivity gains ever materialize, or we end up just catching up on the news or staring out of the window to avoid feeling sick, the fact remains that the technology needed for full autonomy remains prohibitively expensive. Bernstein's Warburton reports that the lidar unit essential for properly locating the car costs more than $60,000 (about 53,600 euros) from the current market leader, Velodyne, although mass production would reduce that significantly. To some automakers, it will be a long time before the technology becomes a mass-market proposition. "Once you go to hands-off, there is so much technology in the car that it becomes extremely expensive," Citroen CEO Linda Jackson said on the sidelines of this year's Shanghai auto show. "So, will that be accessible to everybody? It's a big question. I'm skeptical about when we will actually get to that point."